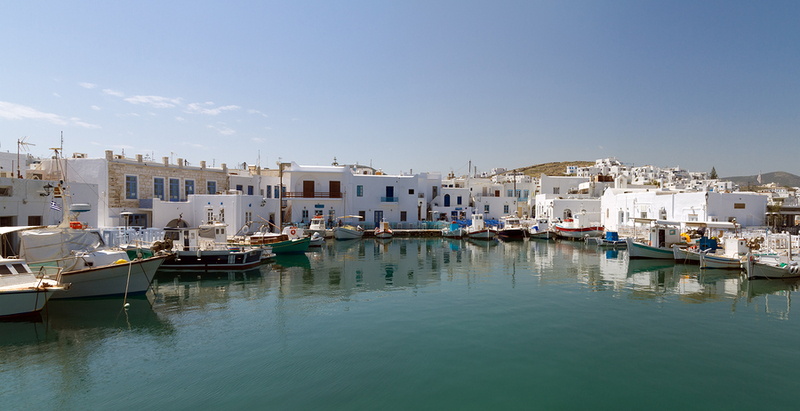 Paros Island in the Aegean Sea in Greece, is basically a sloping, 2500-foot mountain, famed for its beautiful beaches. The capital, Parikia, is set in the location of the ancient capital of Paros and has houses built in the traditional Cycladic style with flat roofs, whitewash walls and twisting vines gracing blue doors and shutters. The town’s picturesque ambiance is enhanced by the numerous gardens of orange, and lemon trees and pomegranate bushes. Marble is abundant on the island, and Parian Marble has always been felt to be particularly fine and was coveted by ancient sculptors. A medieval castle, remains of which are set upon a seaside rock, was built entirely of marble. Numerous reliefs, inscriptions, columns and other antiquity remnants, including abandoned marble quarries are found in abundance on Paros. 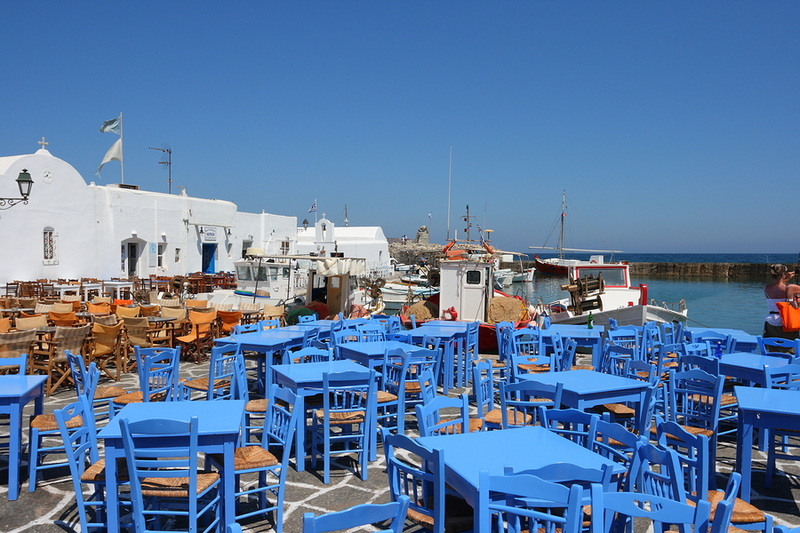 At least a dozen small islets surround Paros, the largest of which is Antiparos. The biggest attraction of Antiparos is Agio Ioannis, a cave lined with stunning stalactites and stalagmites that are 45 million years old. However, what the many islets, including Antiparos offer, are a number of isolated anchorages in the waters surrounding Paros. Parikia: The town’s main church, the Ekatontapiliani, is in Parikia’s main square and is believed to have been founded by Saint Helen, the mother of Roman Emperor Constantine I the Great, during her pilgrimage to the Holy Land. The pride of Parikia, the church dates to the sixth century. A baptistery on the same site was built in the fourth century, making the monument one of the oldest examples of Byzantine ecclesiastical architecture in all of Greece. It’s known as the Church of 100 Gates, however, one will only ever be able to find 99 gates, as apparently the location of the 100the gate is a secret. On the side of the church is the Archeological Museum of Paros: A small museum, nevertheless, the exhibits feature early Cycladic artifacts, and statues, carved from Parian Marble, all of which were excavated on Paros, and Antiparos Islands, including a fragment of the Parian Chronical, a marble inscribed chronology of ancient Greece. Naussa: The bay of Naussa, located on the north side of the island, is a safe, spacious harbor that was closed by a chain in ancient times. 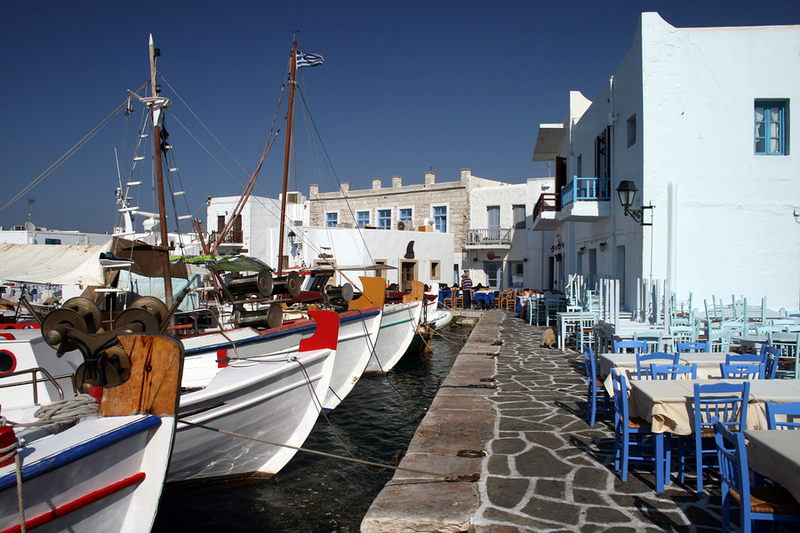 Naussa is a lovely little Cycladic village with a square on the harbor filled with Tavernas. This is a very relaxing and scenic location for a meal or simply to sit for a drink and enjoy the ambiance. Lefkes: Located at the top of the island, this village offers unmatched views of the whole island. Housed within its well-preserved neoclassical and traditional Cycladic buildings are the Museum of Aegean Folk Culture and the Folk Art Museum. The white marble Church of Agia Triada has, inside, rare Byzantine relics. Drios: Located on the southeast side of the island, has a good natural harbor. The Turkish fleet anchored there on its annual voyages through the Aegean during the Ottoman rule over Paros, between 1537 and 1832. Monastery of Agios Antonios: Abandoned, what is left of this monastery is on the hilltop of the village of Kephalos on the eastern side of the island. Around are the ruins of a medieval castle which was raided by the Turkish admiral Barbarossa in 1537. Monastery of Agii Anargyri: Founded in 1660 and occupied until 2000, this monastery occupies a hillside spot providing incredible views across the bay and along the white and blue rooftops of villages to the west. Bring an empty water bottle to fill from the holy spring on the property, bubbling since around 1779. The Byzantine Path: All inhabited Greek Islands feared pirates for many centuries, and the inhabitants of Paros were no exception. During this time on Paros, stone streets were built inland to connect villages to one another, without villagers needing to rely on an exposed coastal route. The best-preserved section of these old streets is the Byzantine Path, which today is a lovely inland hike. From Lefkes, follow the path through olive groves with wild flowers peeking out on either side to the 1,000 years old village of Prodromos. This hike takes about an hour. Extend your hike, if wanted, to the village of Marpissa, with its 17th-century houses, windmills and Byzantine churches, or hike the strenuous uphill route to the monastery of Ayios Antonios. Marble Quarries of Marathi: In antiquity, the chief source of wealth of Paros was Parian marble, which was exported from the 6th century BC onwards. Paros built its fortune and fame on this stark white marble. The quarries outside the village of Marathi were mined until the 19th century. At the mine, the striking alabaster rock can still be seen, and well-preserved industrial buildings still surround the site. The great Greek sculptor Praxiteles used this marble to create his masterpieces. The famous statue of Venus de Milo was carved from Parian Marble, and this same marble was used to build Napoleon’s tomb. This is a traditional Cycladic Island; a great island in which to relax, meander, and really soak up the unique feel of the white cubist Cycladic architecture and ambiance, found only in the Cycladic Islands of Greece.